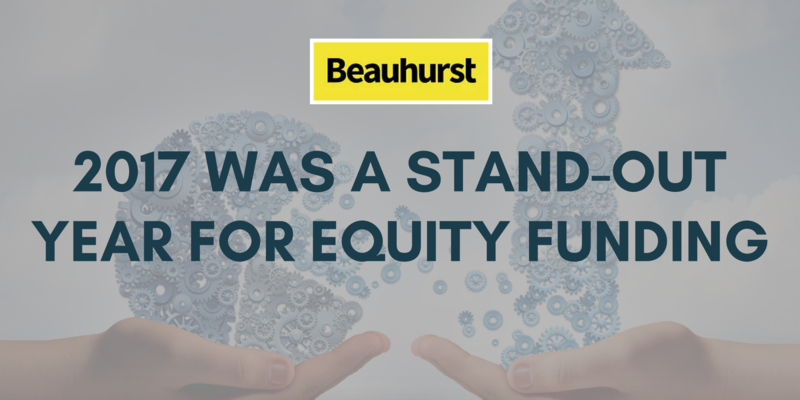 The Business Funding Club is proud to present this guest article from UK startup and scaleup database Beauhurst. 2017 was a record year in a number of ways. More cash was invested in British high-growth companies than ever before, and it came in ever-larger deals. Fintech growth shows no signs of slowing, and we’re seeing more interest from government in the high-growth ecosystem than perhaps any time in history.This is all particularly remarkable given the gloomy prospects anticipated in the wake of Brexit. Even now, forecasts belie the strength of the high-growth economy – with foreign investment in UK firms at its highest since records began. In December, we declared 2017 the year of the megadeal. Days afterwards, another two deals worth £50m+ apiece closed. In total, the year saw two of the three biggest investments since 2011.Of course, huge investments aren’t right for every company. And indeed for the first time, we saw a drop in the percentage and volume of seed-stage deals. There’s more cash out there - particularly from foreign investors - but it’s going into firms that have already raised millions.What does this mean for the high-growth landscape? Nothing, we hope, disastrous. The crowdfunding market, typically populated by nascent B2C startups, looks to have reached equilibrium after its meteoric rise from 2011-15. Angel investment has remained more or less steady in recent years, too, with both seeing a slight uptick in deals over 2017. Geographically, the funding landscape is not diversifying. London’s share of equity deals has been creeping up since 2013, and last year was no exception. The capital now boasts more than half of all deals (51%) in the country. The North East continues to see declining deal numbers, completing just 27 over the course of the year – fewer than any previous period. This is partly due to the huge decline in deals backed directly by the government: hitting a peak of 48 in 2013, government-backed investments last year plummeted to just 13 (compared to 45 for London, an increase of 11 on 2016). An interesting comparison is to the North West, which has also seen governmental support tail off in the last three years – but no sooner did it do so than PE and VC firms leapt in to fill the gap. The same happened in the West Midlands. What’s keeping the private sector at bay in the North East? The UK is famed for its fintech, and 2017 saw the sector’s best year yet. While broadly deal numbers haven’t increased, fintech’s ascent has been remarkable, and last year saw firms in the sector secure over £1b for the first time. Britain now hosts a clutch of fintech super-startups, some of which (TransferWise and Funding Circle) have made it to unicorn status. Other foals likely to mature this year include WorldRemit, Algomi, LendInvest, and at least one challenger bank.Indeed, challenger banks came into their own for the first time last year, securing 19 raises and over £500m in funding. The best-known and largest (by amount raised) are Atom, Starling, and Monzo, but at least half a dozen others have now achieved valuations in the tens of millions.A broader question about the fate of our tech ecosystem remains, but the huge funding rounds of 2017 have set fintech firms up for success. 2017 was a great year for business funding. Could your startup or scaleup be one of the businesses that make 2018 even better? Make it happen at Business Funding Club’s Networking with Funders event TODAY (17.30 - 20.30) at WeWork Aldwych House! Get your ticket here.